THE WEATHER THIS week has been a mixed bag, but forecasters are expecting things to pick up ahead of the bank holiday weekend. Although tomorrow will start off mostly cloudy and misty, it will brighten up as the day goes on and Saturday will be a brighter day with sunny spells. 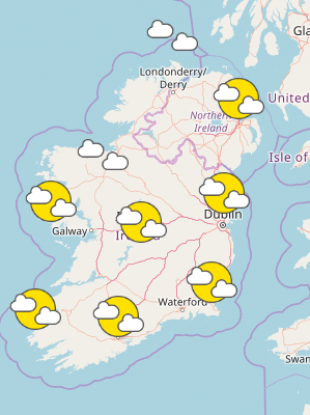 Met Éireann said there may be a few cloudier periods with the risk of a little drizzle, especially in the northwest in the evening and night. Highest temperatures nationally will be between 15 and 19 degrees with light to moderate south to southwest breezes. Sunday will be mainly dry with sunny spells. Temperatures are expected to reach 20 degrees in some areas, though it will be cloudier in the northwest with some light rain. The bank holiday Monday will also be dry and sunny – with a chance of drizzle in some areas – with temperatures of up to 20 degrees. Email “Temperatures to reach 20 degrees over bank holiday weekend ”. Feedback on “Temperatures to reach 20 degrees over bank holiday weekend ”.